With an underfloor heating system, the floor itself becomes the heat emitter and the room is heated from the floor upwards (unlike wall mounted radiators where the room is effectively heated from the ceiling downwards). Underfloor heating is widely used in northern Europe and is now becoming poplar in the UK, both for new builds and for updating existing properties. A water based underfloor heating system uses water heated to lower temperatures than conventional water central heating, which makes it ideal for use with a high efficiency condensing boiler and also heat pumps or solar water heaters. The temperature of the water is controlled by mixing the water in the pipe with hot water from the boiler to achieve the required temperature and it is then distributed, via a manifold, to the various zones in the property. Each zone can be heated and controlled independently. 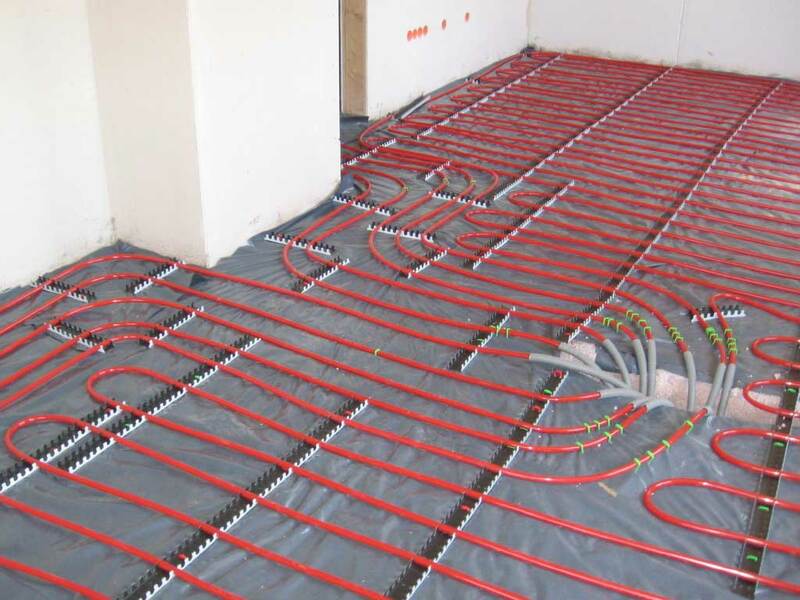 In new build properties, the heating pipes are usually embedded in the floor screed and in existing properties with solid floors, the pipes are normally laid on the surface and covered by timber, laminate or tiles, resulting in the floor level rising and the need to lift doors, skirting boards etc.